Projects - Tom Spriggs Architect "
This project was completed under Permitted Development rights, so not needing Planning Permission. It shows what can be achieved with a relatively small extension, and clever use of internal planning. A few internal walls were removed, and a wc formed in what was an old doorway, with new laundry closet ‘squaring’ the room. Detailed planning stage drawings were completed including kitchen layouts and dimensions. The builders then constructed the shell and fit-out based on these drawings and outline specification created by Tom Spriggs Architect and the clients. This project was developed to improve existing kitchen facilities. The building had a 1950’s extension to the rear that bridged over to the raised ground floor. The proposal included removing the poorly performing addition and replacing with a more suitable and modern extension. Housing the kitchen within the main building’s plan makes use of high ceilings and cornices etc, while the new floor space provides a well lit extension to the dining space and wc/lobby facilities. Overall the replacement rear extension offers better laid out spaces, increased daylight and thermal performances and projects rearwards less than the existing extension. 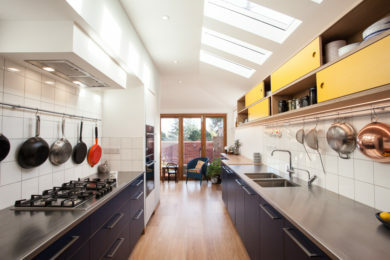 This kitchen extension made great use of space by moving the kitchen to a new, bright extension and forming a highly practical ground floor utility and shower room in the former kitchen space. 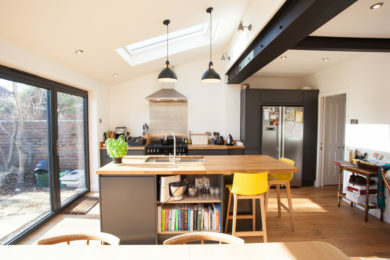 Structural alterations allowed for a decent cooking area and a high specification contemporary kitchen makes the most of the naturally lit and well laid out space. The project included a new first floor bathroom, the kitchen extension, forming a utility-come-shower/wc at ground floor, re-landscaping the garden and structural alterations to suit. The clients of this project, like many, wanted to create a better family and friends orientated kitchen-dining space. An existing single storey rear portion of the building (dating to around the 1940s) was home to the existing kitchen, small utility and dining space. These spaces were divided by walls, changes in level and a large fireplace. Through discussion and negotiation with the local planning authority a preferred option was granted permission to remove the chimney, the stack and internal walls. This opened up the area for a kitchen diner space more suited to current lifestyles. Careful development with the structural engineer and contractors throughout the process also stabilised some of the existing walls, tackled some damp ingress and opened up the roof structure to provide height and daylight to the long space. Loft conversions can add significant floor area and value to many buildings. Smaller Victorian terraces typical of Exeter are not always the most suitable for conversion due to a shallow roof pitch limiting the headroom. Internal configurations of some terraces also make fitting in a compliant stair difficult. The owners of this two bed terrace were looking to improve the daylight and ventilation, create a home office separate from the second bedroom and increase the storage capacity of the house with a limited budget. A scheme was developed where the loft conversion was kept open to the existing stair and landing, creating a form of mezzanine over the bedrooms. This allowed rooflights to illuminate the dark internal landing and stack ventilation for the whole house. Keeping the office……..
Alterations to improve the entrance and kitchen areas of a first floor flat were proposed. The project required design, planning application and building control drawings. The proposals involved a new kitchen, raising the ceiling, installing new rooflights throughout, altering the wall positions and function of the eclectic mix of spaces surrounding the entrance stairs. The resulting entrance hall is light, airy and far more suited to the daily functions. A separate laundry/utility and wc are off this hallway. The owners of this smallholding and farmhouse wanted to update the dilapidated building and make the most of the view. An existing sub-standard extension planned to be removed formed the main footprint for the new works. Extensive internal alterations allow for a more efficient layout, and better use of the site, including a new entrance, segregated home office and space for woodchip heathing system as well as the commanding views. The axis of the extension is orientated towards the evening sun and wrapping round as many large windows to make the most of the expansive views from as many areas as possible. A lighter-weight organic balcony structure wraps around the building allowing for sheltered external social and dining space, all with the view. The nature of the existing buildings and the new foyer to be created between them required a three-dimensional approach to design ensuring that the new building would suit the tight site and complexities of the multiple client groups. By working in this manner new opportunities for daylighting and views within the spaces were discovered and a better final solution was created. Ideas and discussions were had in a collaborative manner and Hilary has since taken the project to a planning application with client sign off…….. Working in partnership with a local designer, Through the Woods, and in very close collaboration with the client this project involved general refurbishment throughout, a significant two storey side extension and new garden studio. The client had strong ideas and brought a lot of input to the project, she drove many of the design decisions and it is a good example of how an architect can truly be an ‘enabling service’. Many design, material palettes and layout choices had already been tested by the clients and our services focussed upon securing planning consent, and a full building regulations & construction design service. Standing in central Exeter this grand Georgian terraced house had been altered previously with an odd arrangement to the rear involving a stepped elevation, varying roof levels, retaining walls and basement access. Several design studies were undertaken to work with the clients to develop and build upon their own ideas and how any extension would impact upon the views out of the existing windows and how it would sit with the garden and sunken basement access (A separate flat requiring fire escape egress). This rather unusual 1960s building had been tastefully and carefully remodeled internally by the previous owners and 5 Points Architecture. The work made the most of the upside-down living and internal spaces but did not connect with the garden or outside spaces very well because of the steeply sloping site. 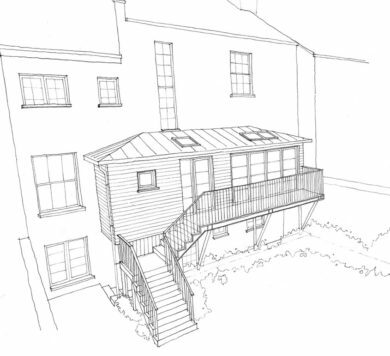 Previous un-built planning permissions existed for a balcony/terrace over a side extension. The new owner wished to create a connection with the garden and views, as well as extending the building to a four bedroomed house with a larger extension than previous designs. Built at the bottom of the garden, this design included bi-folding sliding doors and all timber construction to enable the client and neighbour-carpenter to construct quickly. The large folding doors open up in all seasons, protected by the overhanging roof and extend the office into the garden in the summer. Structural exposed shelving and a beech-faced ply interior balance rustic ‘shed-chic’ with the warmth of natural timber. With electrics and insulation the building is able to be used year-round and enabled a separation of work and home by having a short walk commute to the bottom of the garden. Deep structural shelving forms the rear wall giving a large storage wall for equipment and magazines. A compact but high spec garden building built at the back of a small Victorian terraced garden in Exeter. The design intended to create a courtyard feel and provided some very necessary space to house the owner’s 5 bikes and growing tool collection. Featuring a planted green sedum roof, reclaimed bricks, reclaimed timber joists, cedar cladding and powder-coated aluminium windows and door. The design intent was to be flexible for future office use and is insulated and fitted with electrics. The project was a self-build and site assistance was given. Its design was formed to avoid an existing ornamental tree, which was saved throughout construction and blossoms with pink flowers every spring. Unauthorized altering of a Listed Building is classed as a criminal offense under the Listed Building Act. It is important to gain permission to make any alterations that come under the act. Even replacing windows falls under this. Alterations need to be respectful and sympathetic to the Listed Building and any outbuildings and structures within the gardens. On this project the applicant wanted to improve access to their garden, and improve access to the front door, currently up some very steep steps. A simple and sympathetic design was created that replaced the existing sliding sash window with a pair of matching-style timber doors out to a new paved area. The doors open inwards to make the most of the existing opening and are glazed with thin double glazing and timber glazing bars. An existing agricultural hut gave the inspiration for this proposed holiday let in a rural location. The proposed is a two bed holiday let under a galvanized steel curved sheet roof following the form of Nissen huts and agricultural sheds. The new proposed building will be insulated and up-to-date to minimise impact upon the environment and area. Victorian houses are generally well suited to modern living, being well built with adaptive and generous, well lit rooms. They are also very attractive and many boast stained glass windows, patterned tiling and historic features. This project involved a grand Victorian house that had many such loved features and had been a cherished home for a number of years. Following diagnosis of Parkinson’s Disease, the owner weighed up the benefits of either moving house to be prepared for any likely reduction in mobility or to adapt their own current home. Several sketch options were quickly produced as a feasibility and briefing exercise to determine if any alterations would give the space required, without causing any detriment to the proportions and spaces. Survey, sketch proposals and on-site assistance was given to a refurbishment project following purchase of a terrace that had not seen any maintenance for a number of years. The works included new kitchen, bathroom, electrics & heating throughout and redecoration and plaster repair work. Structural alterations to the kitchen area improved the layout and redesign of the bathroom enabled inclusion of a bath and separate shower. Drawings provided enabled like-for-like quotations ahead of formal tendering. Built in the garden of a large 1930’s house, a new decked area surrounds a new hot tub was designed. The client wished for a hot tub but wanted to integrate it into the established landscaped garden. Keen to create subtle changes in level and a new access from the existing terrace that limited access down to the lower garden, the new deck is formed over two levels with new steps giving a new gentle route down into the garden. A site was settled upon and the design makes use of brick and knot-free cedar to harmonise between the existing brick-built house and walls and the new hot-tub. Bricks and mortar for new walling were carefully chosen and matched to suit the existing building and garden walls. The existing doctors surgery has been in use for a number of years. Ongoing issues raised by the patient participation group identified that the current reception hatch does not give sufficient privacy from the waiting room and there was no first floor access for disabled patients. Proposals were drawn up to discuss with the practice partners a few options that attempt to resolve this and some other areas that caused difficulty in running an efficient practice.